Constipation can be described as a condition where there is less frequency of or difficulty in bowel movements. The symptoms that identify you as having constipation are only few bowel movements in a week like two or lower, straining during the time of bowel movement 25 to 50% of the time, incomplete evacuation of the bowels, pain, vomiting, swollen abdomen and hard and small tools. 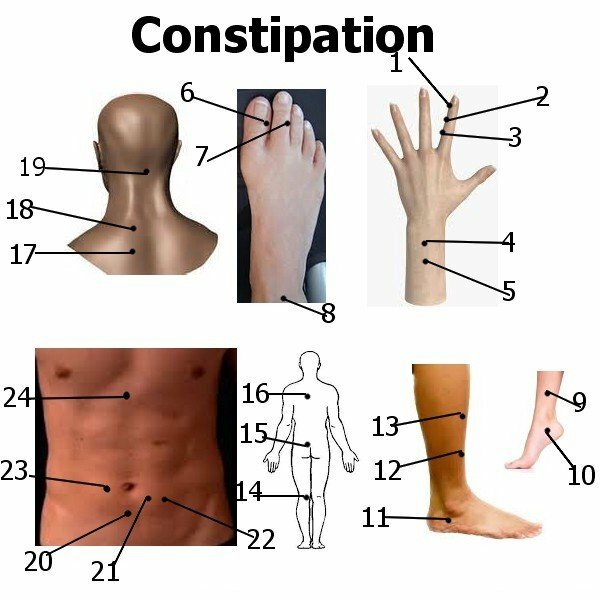 Generally, all the people suffering from constipation, do not need as such treatment except for a very small section of people who face severe constipation problems. If the symptoms of constipation prevails for more than two weeks you should visit a doctor. So that if someone is at initial stage of colon, treatment can be done. The tests that are taken include colonoscopy, blood test and the barium studies. To avoid constipation, having adequate amount of water and a proper diet in a day is mandatory. Precaution: If you are suffering from any chronic disease, long-standing illness or from a disorder involving tissue change or degeneration, you should not do acu-point stimulation. Pressure should also not be applies on acu-points before or after 1/2 hour of taking hot water bath or taking your meal.